You can perform in-storage computations when using dataflows with a Power BI Premium subscription. This lets you perform calculations on your existing dataflows, and return results that enable you to focus on report creation and analytics. To perform in-storage computations, you first must create the dataflow and bring data into that Power BI dataflow storage. Once you have a dataflow that contains data, you can create computed entities, which are entities that perform in-storage computations. The following sections describe how to create computed entities on your dataflow data. Once you have a dataflow with a list of entities, you can perform calculations on those entities. 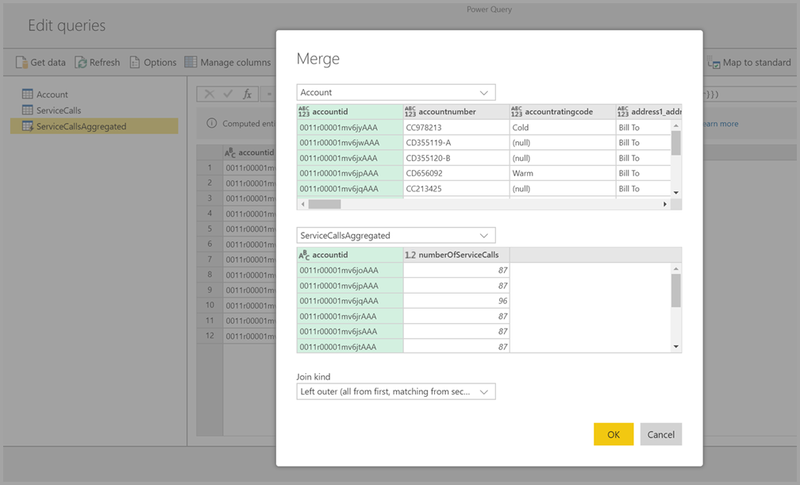 In the dataflow authoring tool in the Power BI service, select Edit entities, then right-click on the entity you want to use as the basis for your computed entity and on which you want to perform calculations. In the context menu, choose Reference. For the entity to be eligible as a computed entity, the Enable load selection must be checked, as shown in the following image. Right-click on the entity to display this context menu. By selecting Enable load, you create a new entity for which its source is the referenced entity. The icon changes, and shows the computed icon, as shown in the following image. 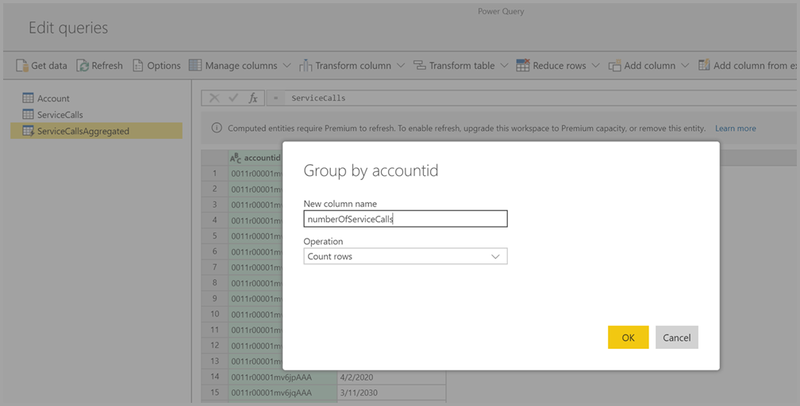 Any transformation you perform on this newly created entity will be run on the data that already resides in Power BI dataflow storage. That means that the query will not run against the external data source from which the data was imported (for example, the SQL database from which the data was pulled), but rather, is performed on the data that resides in the dataflow storage. What kind of transformations can be performed with computed entities? Any transformation that you usually specify using the transformation user interface in Power BI, or the M editor, are all supported when performing in-storage computation. 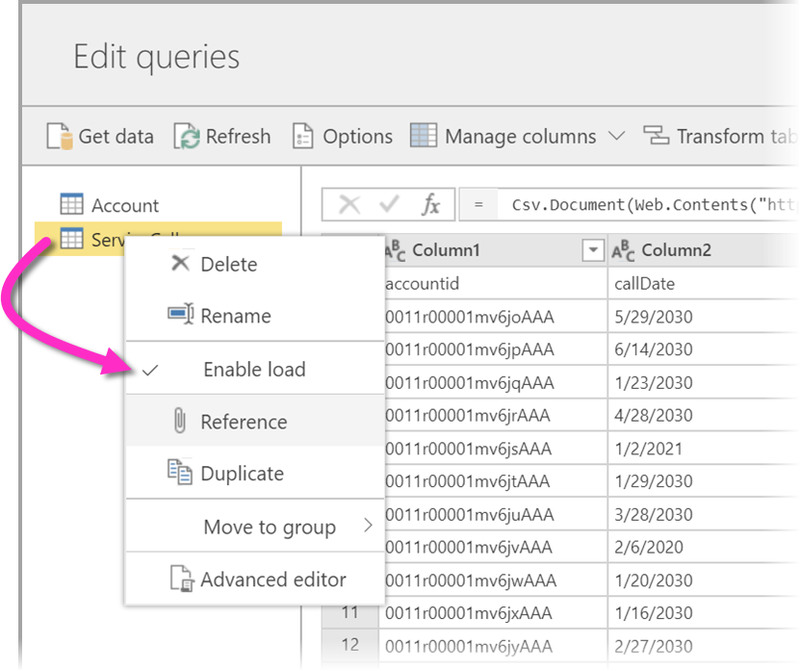 Consider the following example: you have an Account entity that contains the raw data for all the customers from your Dynamics 365 subscription. You also have ServiceCalls raw data from the Service Center, with data from the support calls that were performed from the different account in each day of the year. Imagine you want to enrich the Account entity with data from the ServiceCalls. First you would need to aggregate the data from the ServiceCalls to calculate the number of support calls that were done for each account in the last year. Next, you would want to merge the Account entity with the ServiceCallsAggregated entity to calculate the enriched Account table. And then you can see the results, shown as EnrichedAccount in the following image. And that's it - the transformation is performed on the data in the dataflow that resides in your Power BI Premium subscription, not on the source data. It's important to note that if you remove the workspace from Power BI Premium capacity, the associated dataflow will no longer refresh. When working with dataflows specifically created in an organization's Azure Data Lake Storage Gen2 account, linked entities and computed entities only work properly when the entities reside in the same storage account. For more information, see connect Azure Data Lake Storage Gen2 for dataflow storage (Preview). Linked entities are not available for dataflows that are created from Common Data Model (CDM) folders. For more information, see add a CDM folder to Power BI as a dataflow (Preview). As a best practice, when doing computations on data joined by on-premises and cloud data, create a new entity to perform such computations. This provides a better experience than using an existing entity for computations, such as an entity that is also querying data from both sources and doing in-lake transformations. This article described computed entities and dataflows available in the Power BI service. Here are some more articles that might be useful.